HNGU Online Admission 2018-2019: Candidates may apply online for Hemchandracharya North Gujarat University various faculties admission on official website admission.ngu.ac.in. This is a official web portal to apply on admission.ngu.ac.in- HNGU Online Admission for academic year 2018-19. Students may apply online for various courses like Diploma Courses, Degree Courses, Master Courses, Ph.D and M.Phil through official website admission.ngu.ac.in. Candidates who want to admission in HNGU affiliated colleges, they may go visit HNGU Online Admission web portal admission.ngu.ac.in. The HNGU application form for UG and PG courses is available on web portal. Students have to fill their Educational details, personal details and other information in application form. Candidates are need to upload photo and signature image and other information. Candidates are advise to must read all instruction well before apply online. Students have to go on official website admission.ngu.ac.in. 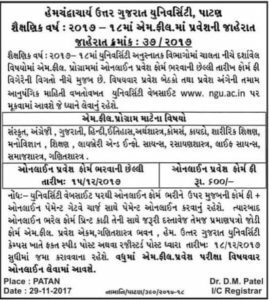 The Hemchandracharya North Gujarat University released admission notification for Bachelor in Science in academic year 2018-19. Applicants have essential qualification they may apply for HNGU B.Sc admission 2018-19. Candidates are advise read all instruction like education qualification, age limit, important date, how to apply and etc on official website. University published notification regarding HNGU M.Phil Admission 2017-18. HNGU announced advertisement for admission in M.Phil in various subject mention in advertisement. Eligible students may read all information like how to apply online, last date for apply online, subject vise seat and other information on its official website. Applicants have to fill online form before 15th December, 2017 through official website and submit fee Rs. 600/- including gate way charge. Candidate have to take print out application form and submit it with necessary documents and other at Pravesh Ekam, Ganitshashtra Bhavan, HNGU campus by Speed Post or Register Ad on or before 18th December, 2017. The Hemchandracharya North Gujarat University released notification regarding admission for HNGU MA-MCom. Candidates who have essential qualification they may apply for HNGU MA-MCom Admission 2017-2018. Hemchandracharya North Gujarat University announced notification regarding admission 2017-2018 academic year. HNGU invite eligible candidates for admission through online mode. Students may apply for HNGU BA, MA, BCom, MCom, BSc, MSc BEd, MEd,Online Admission 2017-2018 courses. They may apply on admission.ngu.ac.in. Students have to fill their Educational details, personal details and other information in application form. Students may upload their photo and sign and other documents. Students are advised that bookmark this page and be touch regular on this page for get more latest updates about HNGU UG/PG Admission 2017-2018.